If you live with pets, then you need to make proper arrangements to take care of pet hair and the odors. Agree? In this article, I am going to talk about cats litter boxes to take care of these cute animals and their odors. I have shortlisted the top-rated models to help you choose only the worthy litter box for your precious cat. 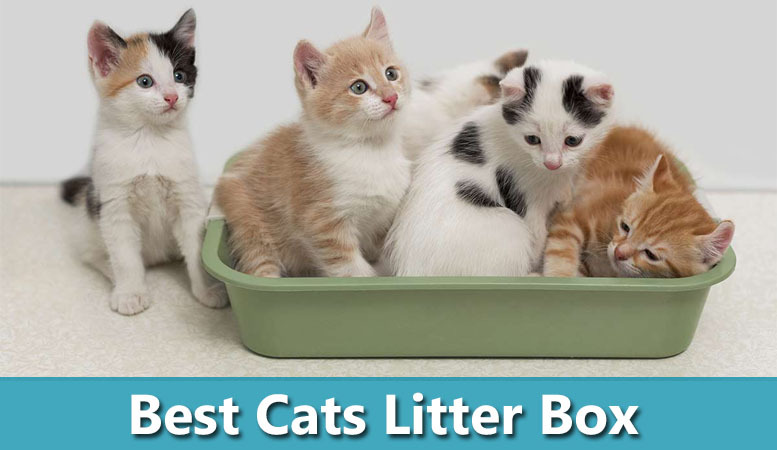 Here comes the list of best cat litter boxes 2019. The IRIS is a sleek and stylish looking litter box which comes with a scoop and available in gray and white color. 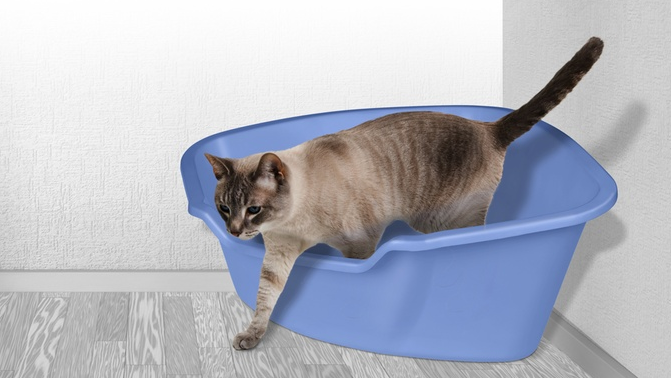 The modern design of this litter box makes it suitable for any room. It measures around 20″ x 14.75″ x 14″, which is not going to take much space in your room. The unique design of IRIS keeps the spraying inside and waive litter tracking. Even the top-entry design with small holes in the lid are very helpful eliminating litter particles from cat’s paws. The beauty of this litter box is the comfort of waste disposal, thanks to the rounded shape and included litter scooper. What’s more interesting? the unpleasant odors are trapped inside the box. Overall, IRIS is a top-rated litter box with a unique design which keeps the dogs out and keeps the bad odors trapped inside so the house doesn’t smell. 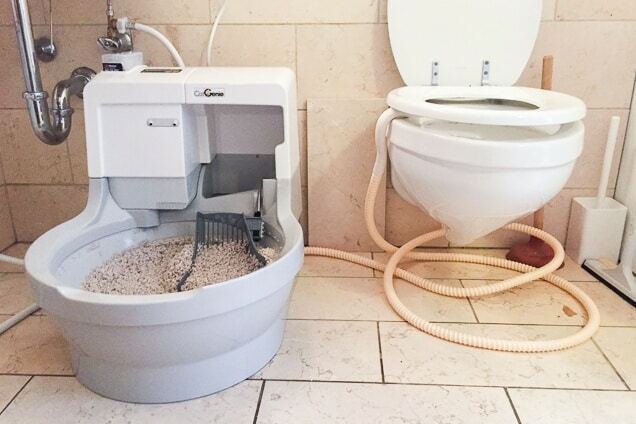 We cannot recommend enough this greatest litter box more. Catit Jumbo is one of the highest-rated Hooded Litter Pan. The massive size and durability come at an affordable price. What makes this litter pan popular is that it takes care of all the cat’s messes which means no tracking. The large size of this litter box ( 22.4″ x 18.3″ x 17″ ) makes it suitable for households having multiple and large cats but also consumes a little extra space to get the job done. Regardless of its big size, Catit Jumbo is very easy to clean and refresh with new litter. You can easily lift the hood and the built-in bag anchor is very helpful in keeping the litter bags open making you completely hands-free to scoop. Whereas, the carbon filter reduces and contains the odor inside the box. Last but not least, depending upon your cat’s choice you are free to remove the box’s hood and attached the door. Overall, Catit Jumbo is an awesome litter pain with a handful of features. The massive and durable design makes it a solid option for the money. Van Ness High Sides Cat Litter Pan is the most basic yet affordable litter pan. The plastic body is made with recycled materials, and the polished finish is an odor as well as stain resistant. Either you have a small kitten or large cats, this litter pan can accommodate them as it’s available in large and giant size. The high sides give your little friend messier bathroom habits enough space to avoid scattering of litter. And regardless of the high sides, a small dip in the front is useful for older cats having arthritis. 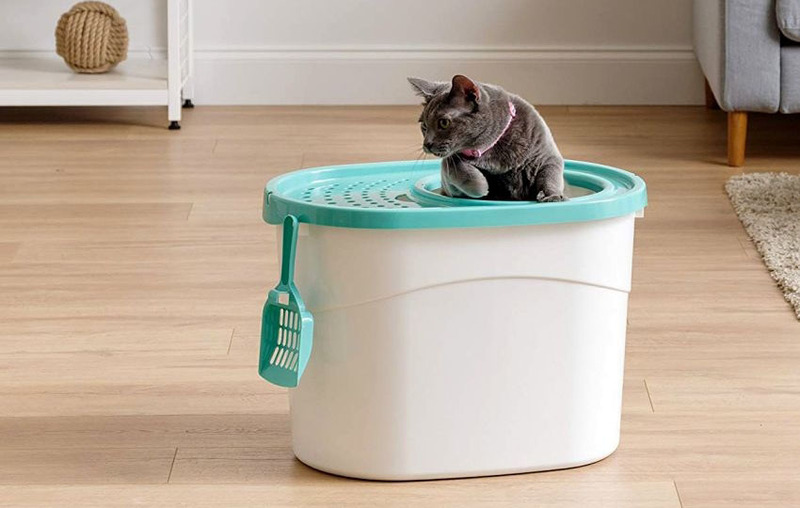 Many reviewers said that this litter box is a great relief if you want to go on vacations while leaving your cats home because it holds a lot of litter. That said, this litter box is cheap for the price but great for design and builds which makes it a simple yet effective litter box. Call it a stand-alone or disposable litter box, it’s the same. Nature’s Miracle litter box liners are an excellent option for keeping the litter box clean and fresh. These completely disposable boxes are available in three sizes and are ideal for you while you are travelling or want a simple cleanup. Are you worried about leakage? These boxes are crafted using super sturdy materials which makes them safe for landfills as well. The beauty of this box is that air can pass, but water cannot. The airflow keeps the moisture and odor low and the box drier for long time. Similarly, the built-in baking soda is helpful to reduce or eliminiate the odors. Using these disposable boxes eliminates the need to scrub the plastic box: Once used simply throw it away and replace it. It’s recommended for you to keep them changing every four weeks to maintain the freshness. If you are willing to spend some extra bucks then you should definitely consider ScoopFree Self-Cleaning an automated litter box. This self-cleaning litter box only requires you to remove and replace the disposable tray weekly or every few weeks instead of scooping waste on daily basis. Simply pour the crystal litter in the disposable tray and load it in. The built-in sensors can detect when your cat uses the box and then starts to rake away waste after 20 minutes. In a meantime, the crystals begin to absorb moisture and bad smell, and then dehydrate solid waste. After that, the automatic rake sweeps the box, waste is shifted to the covered trap and locked away. This box uses crystal litter instead of clay or clumping litter because it’s five times more effective than other litters. The health counter in this litter box keep track of your cat’s health and provides you insights about it like how many times per day your cat used the box. Cat Genie Self-Washing and Self-Flushing Cat Box is a pricey model which does everything automatically without having you touch or change litter again. The only thing that you need to do is to establish a cold water line in your bathroom or laundry room for easy litter cleaning. During the cleaning cycle, the CatGenie eliminates and liquefies solid waste, then shift it to your toilet or utility sink drain. Then, uses the clean supply of water to wash, scrub and dry the reusable litter granules. So the CatGenie does almost everything from recycling the litter to disposing of the water which also saves wash cost. This litter box is recommended for two or three average-sized cats. That said, CatGenie is an expensive but high-end cat litter box that pretty much does everything by itself. 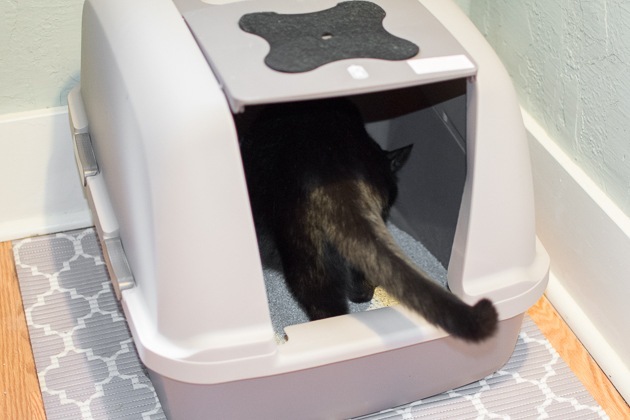 EcoFlex Litter Loo is a discrete litter box which comes with an easy-to-clean enclosure that hides the litter box away, prevents litter tracking and results in the clean floor if you having it in your living room, office or in the bathroom. It works with pretty much every litter box, but the spills over the sides result in odors. The suggestion for you is to better get the same dimensions litter box or make sure to check for “misses” on a daily basis.